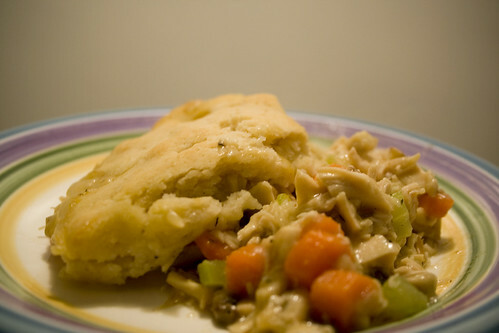 My absolute favorite food in the whole wide world is Mrs. Budd's chicken pot pie served over mashed potatoes or rice. I miss it with all my heart. So I'm now on a mission to re-create it gf/cf style. This was my first attempt at a homemade pot pie ever. Nevermind that it was gf/cf. And it was pretty good! Not even close to Mrs. Budd's but as chicken pie goes, pretty tasty. Too much thyme but that's ok. I am not going to post the recipe until I get it just right, but check that out, looks good doesn't it? The crust was super simple. Better Batter, melted earth balance and water (or rice milk? I forget), mixed together until dough forms and then just spread out on top of the filling, baked at 450 degrees for 12 minutes. The crust tasted great but wasn't nearly the same as the flaky pastry dough pie crust of Mrs. Budd's. On another note... I went to see The Doc yesterday. As you may know, I've been off of my medication for a month now because my white blood cell count had dropped. I also found out that my red blood cells have enlarged, he thinks due to the B12 deficiency. Interesting thing is, my B12 level went back up 15 days after going med free... coincidence?? Anyway, so I went yesterday hoping that I'd be able to convince him that I should stay off the meds, at least for a little while longer. As it turns out, I didn't even have to ask. Because my WBC is still low, he wants me to stay off the meds for another 3 months. He thinks that my Crohn's is going to be manageable for the long term and doesn't think I'm a good candidate for stronger treatments like Remicade and Humira. I was SO happy to hear that. So basically there aren't a lot of options for me at this point since I refuse to go back on steroids or Pentasa. He might want to try a lowered dose of the Azathioprine (Imuran) once my WBC rebounds but I feel (and I think he will agree) that most likely my body will reject it again eventually anyway. So the goal is to keep going with this strict gf/cf/low sugar diet and show him in 3 months that I'm doing great and convince him to let me stay off the meds as long as possible. If I relapse I won't hesitate to rethink our strategy but until then, I'm all about doing this naturally. Just like I've wanted all along. I can't believe I'm at this point!! I feel like a normal human being again and I love it. I'm doing great with the diet, I'm still struggling with cutting out the sugar but as far as gf/cf I'm right on. The thought of cheating and relapsing keeps me focused this time. I know I've done this on and off for years but this time feels different. I have no meds to fall back on this time. I have years of proof that this WORKS. I'm very happy and excited to move forward on my journey to excellent health. Mmmmm. That pot pie does look amazing. Can't wait for the recipe! And! I'm psyched about you going off the meds. You're doing so well!